I'm sure that this neatly selected series of works will whet the appetite of those yet to experience Rautavaara's music. 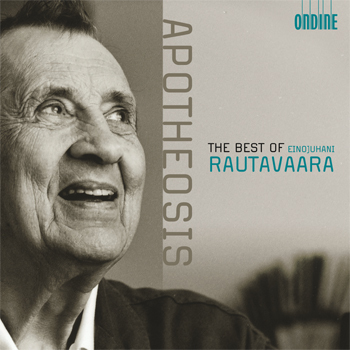 This mid-price CD compilation couples the greatest orchestral hits by Einojuhani Rautavaara, who is one of the most-performed and best-selling classical composers alive. Rautavaara is Finland's most successful composer after Jean Sibelius. He is by nature a romantic, even a mystic, and writes music in a very approachable style. The featured soloists include clarinetist Richard Stoltzman and pianist Vladimir Ashkenazy. The Helsinki Philharmonic Orchestra and Leif Segerstam have countless pedigrees in performing Rautavaara's works, including the Grammy-nominated seventh symphony Angel of Light (ODE 869-2). Also included is Apotheosis with Swedish RSO and Mikko Franck (ODE 1002-2). Finnish film maker Aki Kaurismäki chose this 8-minute recording for the soundtrack of his latest comedy-drama film Le Havre (2011).